Takamine was born November 3, 1854, in Takaoka, Japan. He was trained in the strict Samurai code, which encourages ancestral respect and strong morals and ethics. In 1879 Takamine earned a degree in chemical engineering from the College of Science and Engineering of the Imperial University of Tokyo. Takamine’s education served as a strong foundation for his many positions in government service, chemical industry, and basic research. After his graduation, the Japanese government sent him to attend Anderson’s College in Glasgow, Scotland, for two years (1879-­1881) to improve his English. While in Scotland Takamine was introduced to phosphate fertilizers and their production. 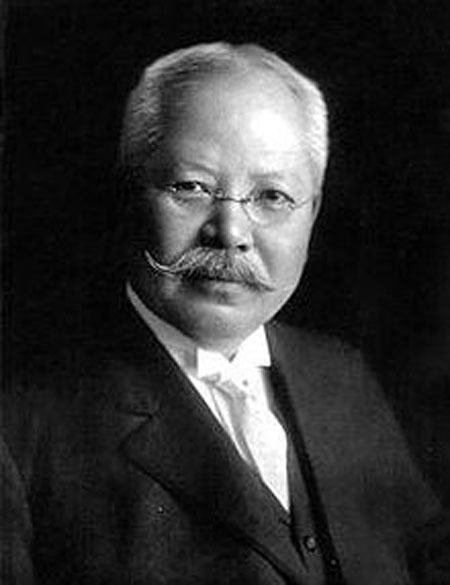 In 1881 he returned to Tokyo to become the head chemist of the Imperial Department of Agriculture and Commerce as well as the head of the patent office. After six years he left civil service to begin his own superphosphate plant, the Tokyo Artificial Fertilizer Company. He opened this first major artificial­ fertilizer plant in Japan in spite of resistance from traditional Japanese farmers. In 1890 he married an American, Caroline Hitch, and moved permanently to the United States. He built his own laboratory in Clifton, New Jersey, to produce biochemicals in 1894. At the lab, he developed a starch­ digesting enzyme from rice that he called Takadiastase. He tried without success to interest the brewing industry in the enzyme. However, the pharmaceutical firm, Parke, Davis and Company, became interested in Takadiastase, and Takamine maintained a close relationship with the firm during the rest of his life. In 1901 Takamine isolated and crystallized adrenaline from the medulla (inner part) of the adrenal gland. He made this breakthrough while working on a joint project between Armour & Co. and John Jacob Abel, a chemist ­pharmacologist of Johns Hopkins Medical School, who had called the substance epinephrine when he studied it in 1898. Although he made his home in the United States, Takamine remained a consultant to the Japanese government on chemical and technological matters. He also continued to seek ways to foster good will between Japan and the United States. In 1912 he arranged with the Mayor of Tokyo for thousands of Japanese cherry trees to be delivered and planted near the basin of the Potomac in Washington, D.C.
For his sustained record of accomplishments in science and technology; Takamine was appointed to the Royal Academy of Sciences of Japan (1913), and for his diplomatic efforts, he was decorated with the Order of the Rising Sun (1915). Takamine died on July 22, 1922, in New York: City. Takamine’s primary legacy rests on his isolation of adrenaline, which led to significant applications in both medicine and the pharmaceutical industry. Adrenaline is used currently in the treatment of low blood pressure and in medical emergencies. Due to his work in purifying and identifying the composition of adrenaline, it became the first natural hormone to be manufactured synthetically instead of being extracted from animal organs. Following Takamine’s lead, American biochemist Edward Kendall isolated additional hormones from the adrenal gland. While Takamine had examined the medulla (inner part of the gland that acts like an independent body), Kendall isolated 28 different hormones from the cortex (the outside wrap) of the adrenal gland. Of these, cortisone has been most useful. Isolated by Kendall in 1935, its anti­ inflammatory properties have led to many applications. Kendall was rewarded for his work with a Nobel Prize for Medicine or Physiology in 1950. The enzyme Takadiastase, which breaks complex starches into alcohols and sugars, was eventually used by the brewing industry and has also been used as a medical treatment for abnormal digestion of carbohydrates. One of Takamine’s most enduring legacies is the display of cherry trees in Washington, D.C., a memorial of his desire to promote friendly relations between his native and adopted countries. The beauty of the cherry blossoms is enjoyed by all visitors to the capital of the United States during the spring. The flowering trees have been used by innumerable artists, photographers, and poets as symbols of international good will, relaying the message that Takamine intended. Posted on March 10, 2015 by Natalie. This entry was posted in Chemists. Bookmark the permalink.